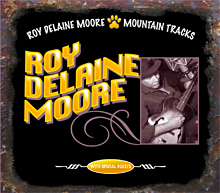 The CD release from Roy Delaine Moore, will be released on Mountain Trax Records mid year. The album is produced by Bob Webber and recorded at Sugarloaf Canyon Productions studio, located in the foothills of the Colorado Rocky Mountains, west of Denver. The ten song selection is the first release from Mountain Trax Records, featuring several special guest musicians contributing to nine of ten original tracks, written and performed by Roy Delaine Moore. instrumentation, including slide guitar, harmonica, banjo, mandolin, acoustic and electric guitars, bass, drums and percussion, make for an enjoyable listing experience. The group sound on the recording is an unexpected update of familiar roots performances which is both refreshing and entertaining. Roy Delaine Moore, John Long (DeltaGrooveRecords), Jack Douglas, Richard Whetstone, Bob Webber, Dave Greenwald, and Mark Hutchinson.